Recently just got out the report from uSwitch which reported that the iPhone 4S was not the most popular smart phones anymore, at least in the UK. Throne by a coup has been a flagship Android phone Samsung, Galaxy S III. Galaxy S III himself took the place of the previous generation, Galaxy S II which had occupied the throne for 11 months before the iPhone 4S replaced 1 month ago. Galaxy S II phone itself is only down to third place, this is certainly quite surprising considering the mobile phone has long been released precisely about 15 months ago. 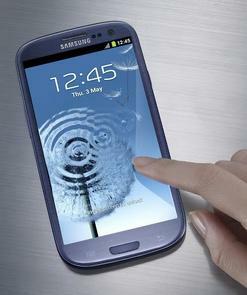 It seems that Samsung's decision to postpone the release of Galaxy S III exactly once, where the resignation is intended to be released this phone when it can available worldwide with a lag time is not far adrift. One factor that also helps Galaxy S III to get England's most popular smart phone due to bombastic number of pre-order.In addition to the above three cell phones, HTC also managed to get a spot on the chart. One X which is a quad-core flagship HTC ranks 4th Galaxy S II below.